A culinary history of Canada is long overdue, even if most of us don't believe we have either a cuisine or a history that is profound interesting. 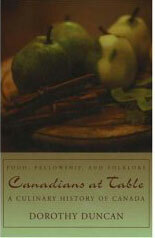 Dorothy Duncan has given us an interesting version of what that might be with Canadians at Table: A Culinary History of Canada. Alas, this is a volume heavy on historical interpretation and light on food, because in reality, she has given us only a paleontologist's history of Canadian cuisine. Ms. Duncan, who has had a long and remarkable career as a historical curator and interpreter in Ontario, is extremely knowledgeable, but she seems unaware, in a school-marmish sort of way, that she's training a macroscope on subjects for which there is more speculation, theory, and folk tales than fact. Her opening chapters about "First Nations" (who, as far as I know, didn't use tables to eat on) are in reality a hodgepodge of theoretical generalities and clichTs that present Canada's pre-European aboriginal tribes as an interconnected matrix of peaceful, buckskin-clad shaman-ecologists living in harmony with one another and with the landscapes they lived in. This is a portrayal that no doubt suits today's overseeing boards of directors and the funding agencies responsible for simplifying our history for schoolchildren, but it is about as textured as portraying Germany as a horde of war-mongering racists, or the English as a nation of freedom-loving foresters in Robin Hood costumes. One of the reasons our aboriginal peoples are called "nations" is that they were as radically different from one another in resources, custom, and outlook as the landscapes in which they lived were varied. And generally speaking, taking care of the ecology, particularly its fauna, was not exactly their special general talent. Still, if you can overlook the elementary school curriculum tone of Duncan's opening chapters, and an overly confident and smooth delivery that occasionally disinforms as much as it informs, there is much useful information in Duncan's book that gets progressively more interesting as she moves toward the present and has real historical materials to draw from. Someday, what she has done will be useful for an adult history of what we put on our tables, how it got there, and why. This book, meanwhile, is the victim of its own ambition. 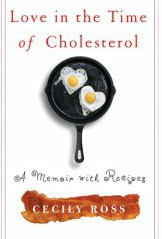 At the other end of the scale is Toronto journalist Cecily Ross's wonderfully unpretentious and unique memoir-with-recipes Love in the Time of Cholesterol. It's an unsentimental yet humane narrative of her husband Basil's heart attack and bypass surgery, and the cuisinal adjustments they've had to make in the wake of it. Ross has long been one of those competent journalists who write invisible sentences, and the skill serves her well here. She tells a remarkably unpreachy story, and nearly all of her post-cholesterol recipes are tempting enough to make you want to cook�and get healthier. 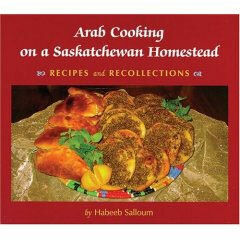 Possibly the most uniquely Canadian book I've seen in several years is Habeeb Salloum's Arab Cooking on a Saskatchewan Homestead: Recipes and Recollections from the Canadian Plains Research Centre at the University of Regina. Salloum's parents emigrated to Canada from Syria in the early 1920s, and settled in Saskatchewan. He grew up as a prairie farm kid, joined the RCAF for World War II, then worked for the federal government for thirty-six years before retiring to a third career as a freelance historian, writer, and, on the evidence presented in the book, a food lover. As cookbooks go, this is the real deal for people who like middle eastern cuisine, but it is a lot more than merely a cookbook. It is also a fine piece of cultural history written by a man about equally rooted in Arab and Canadian culture, in agricultural and nutritional science, and, most firmly, in Saskatchewan's history of rural immigration. It is therefore a useful book on several grounds. More elegantly presented and equally delightful is Janice Wong's Chow, with the subtitle of From Canada to China: Memories of Food + Family. 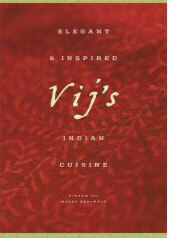 It comes from Vancouver's Whitecap Books, which specialises in food culture, and has become very good at it. Wong is a sharp observer both in and out of the kitchen, and a writer of real charm. Her memoir is about growing up in Prince Albert, Saskatchewan, during the 1960s, where her father Dennis ran a pair of restaurants, one Western, the other Cantonese. On the evidence of the book's recipes, Wong senior was an excellent chef. He was also an interesting and decent human being, and Ms. Wong is a faithful daughter, sticking strictly to his written recipes and passing on the ones she merely remembers. Her fastidiousness pays off. 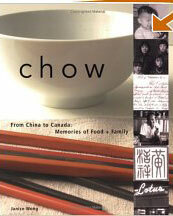 Chow is an utterly authentic memoir, and the recipes are excellent�including one for Dungeness crab in black bean sauce I happened to have been looking for since I first had it at Vancouver's On On, which is where Wong hints that it came from.